Nestled in a small parade of shops between Orpington and Green St Green in Kent. 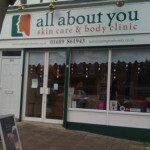 All About You is a friendly unisex skin care clinic & beauty salon offering a broad spectrum of therapies from the necessary to the purely indulgent. Regardless of age or gender, it is our desire to create an immaculate and welcoming salon within which, our therapists promise to provide the truly professional, relaxing experience you deserve.